Miles recently hit his four month mark. I can't believe how quickly time has gone by. He's such a sweet baby. We had his four month check up the other day, and he's growing like a weed. He's weighing in at 19 1/2 lbs, and is 27.5" tall. He can barely squeeze into his 9 month clothes, and our stash of 12 month clothing is comprised of mostly warm weather clothing. I guess that it's time for me to start sewing for him. Anyone interested in baby boy clothing tutorials and projects? Absolutely! I'm having a boy in April, so fun baby boy projects would be super fun to see. He is cute, I can't believe he's that old already. Hey Tricia, what a lovely baby boy you've got. =) I just discovered your blog today and loved it. What a cutie! I am waiting for the valentines themed writing/pic on bum onesie...ha! Definitely interested! My boys are a bit older, but I love seeing ideas for them. Aw, what a cutie! Tutorials, ideas: yes, please! 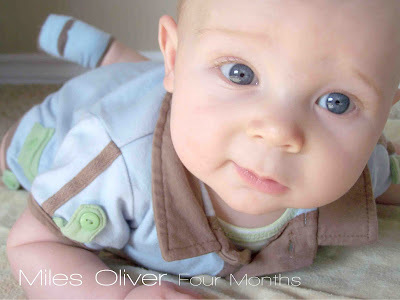 I also have a 4 month old boy (he is our second boy too)... it seems like he is growing up way faster than the first. I love your blog - you make such lovely things! Thanks for sharing! So sweet! I thought Anna was growing quickly, but Miles is waaay weedier than she is in that respect. :) Can't wait to see what cuteness you come up with for baby boys! Yes please on the baby boy tutorials! I just had a baby boy 3weeks ago and I would love some new clothing ideas.